We’ve not featured projects involving fabrics here for a while, probably because we’ve not come across anything incredible, maybe also because we’ve tried to step back from this world to set ourselves apart. My passion revolves around the reduction in design down to its purest form, and this specific piece kicked out some thoughts on making as a process and how it’s developed over time. With the modern age that we live in it’s hard to deny the power that manufacturing has had on our lives. In fact I’m always shocked by the amount of products that come out on a daily basis, it’s almost as if these items have no physical human connection or human thought behind them. Designed by robots, produced by robots. Who would of known that the connected world we now live in would become more sterile over time, quite placid and uncreative in a lot of fields. In others we have strived forward, but it seems to me that we’ve particularly hit a plateu in product design and it’s become hard for individuals to really relate to the objects that they touch and use. I’d hate to think one day that a child would wake thinking that everything should be in front of him without any relation to the production processes and how they’re made, that’s quite sad. I’m not sure if anyone could have put it better, this film below today featuring Kazumasa Nakamura of the Nakamura Kobo Atelier in Morioka City, Japan put a few thoughts like this in my head. Nakamura Kobo is one of the few ateliers that continue to produce homespun, a fabric that’s simple and homely, in Japan, even today the atelier performs almost all of the production processes by hand. 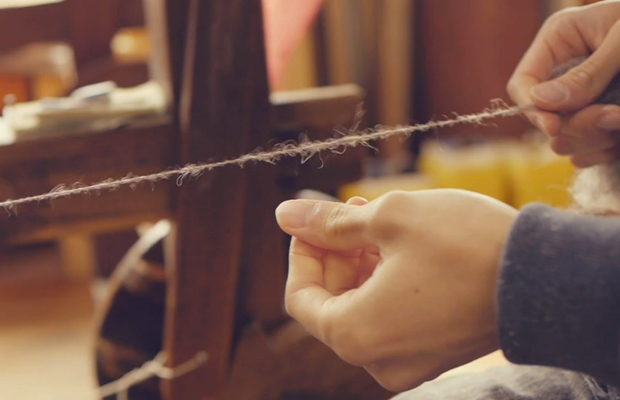 Kazumasa happens to be the fourth generation owner and is committed to preserving and promoting this type of craft. I found it humbling that such a young individual respected the history behind his work so much, it’s also nice to see him talking about making items that can be of use for customers daily lives, rather than specifically emphasising whose works they are. Although they focus on strictly small handmade items, each one is high in quality and serves its purpose perfectly. Treating each one as a specific project that has heart and soul. I hope you enjoy this short but quaint film, it was produced by an independently organised TED event (who I always visit for their talks) in Japan, and they have a couple more on the Yosuke Matsukura vimeo page like this. Currently one on Japanese paper and another on Tumble Dolls, so check them out and keep your eyes peeled for more.